Behind every Eagle Scout, there’s a story. A story of perseverance. Of parents and adult volunteers offering guidance and support. Of merit badges, camping trips and service projects. 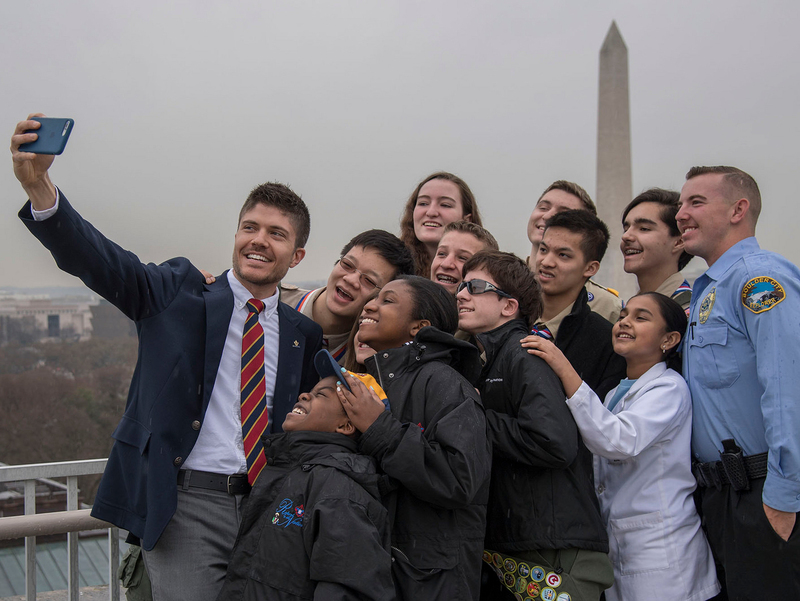 Multiply each individual Eagle Scout story by 52,160, and you’ll begin to see just how much impact Eagle Scouts had on their communities in 2018. Exactly 52,160 young men — representing all 50 states, Puerto Rico and the District of Columbia — earned Scouting’s highest honor last year. With 52,160 Eagle Scouts, the Class of 2018 is officially the eighth-biggest Eagle Scout class in history. If all of those Class of 2018 Eagle Scouts wanted to gather to watch some Major League Baseball, there’s only place they could go. With a capacity of 56,000, only Dodger Stadium in Los Angeles (seen above) is large enough to hold everyone. Exactly 6.49 percent of eligible Scouts earned Eagle in 2018. Here’s a look at the Eagle percentage over the last 10 years. Below, see how the average has increased over time. I see the increase as a good thing. A higher percentage means young people are staying in the program longer, and it means they’re leaving the program prepared for life. Consider this: What would the world be like if 100 percent of adults had earned Eagle? That’s a world I’d want to live in. As always, my thanks to the BSA’s Mike Lo Vecchio, who provides me with these Eagle Scout stats each year. Eagle Scouts, and the volunteers they led, completed 7,987,074 hours of work for Eagle Scout service projects in 2018. That works out to 153.1 hours per project. At the 2018 “value of volunteer time” rate of $24.69 per hour, that works out to $197.2 million worth of service to communities. Note: The real number is probably much higher. Many soon-to-be Eagle Scouts miscalculate the number of hours worked, thereby shortchanging themselves. Read this post for details. Congrats to the Western Region for having the largest total yet again! Fellow Eagle Scouts, how many others were honored in the year you earned Eagle? Here are the 2018 state-by-state rankings, as well as the rank change from 2017 to 2018. Example: The +2 for North Carolina means that state’s rank jumped up two spots: from No. 7 in 2017 to No. 5 in 2018. Scouts didn’t just earn Eagle in one of the 50 states. Here are the numbers for BSA members who earned Eagle in Puerto Rico, Washington, D.C., and the BSA’s Transatlantic and Far East Councils. I used publicly available data to find the number of under-18 boys in each state, as of 2017 (the most recent year available). Notice that Utah remains No. 1, but less-populous states like Idaho, Wyoming and Rhode Island jumped into the top 10. This number has remained pretty steady over the past five years.